Yahoo has denied it's eyeing a 20% across-the-board layoff following a report in TechCrunch yesterday, but could this be a game of semantics? The report noted that Yahoo (YHOO) currently has 14,100 employees, which would map out to around 2,500 workers based on a 20% companywide cut. According to an update by TechCrunch (which, like DailyFinance, is owned by AOL), the Internet portal says: "Yahoo is always evaluating expenses to align with the company's financial goals. However, a 20% reduction in Yahoo's workforce across the board is misleading and inaccurate." Given that Yahoo's year-over-year revenue performance has fallen for three consecutive quarters and it has missed Wall Street's forecast with similar frequency, it stands to reason it's time to "align" the troops. Yahoo apparently thought it would be doing much better for the past nine months. After all, Wall Street's forecasts are often based on a company's guidance. A Yahoo layoff before year-end raises the question of whether the company's fourth-quarter performance and year-end results are shaping up to be worse than the Street is expecting. One clear sign investors should watch for as the holiday-shopping period nears -- a time when advertisers love to be in front of consumers -- is the ratio of advertisers' ads to Yahoo's "house ads." 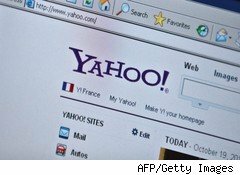 Ever use Yahoo email? Keep an eye on the splashy display ads that take up virtually all of the screen's real estate every time you call up your email. How many of those are touting a car manufacturer's latest model, versus a Yahoo product or service? Meanwhile, an All Things D report, puts the layoffs at around 10%, with the vast majority coming from product organization. And backing into the math, the report notes that would mean roughly 650 layoffs. Either way, a cut of 20% or 10% -- or somewhere in between -- will mean a potentially rotten holiday period for those involved, especially when Yahoo's archrival Google is playing Santa and doling out 10% pay hikes and a $1,000 bonus for every employee.